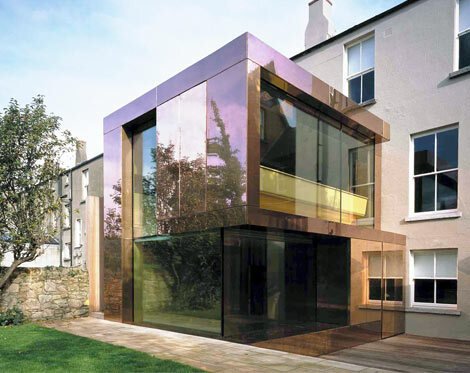 The project involves the construction of a new two storey addition to the rear of a large three storey semi-detached, bricked fronted, Victorian house close to Dublin city centre. 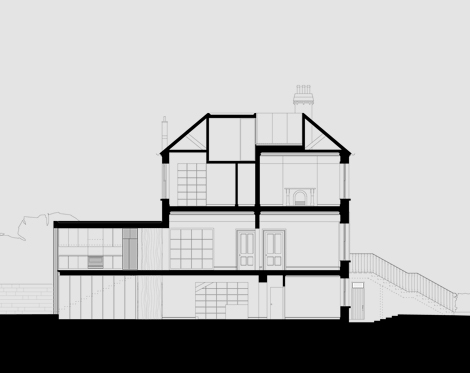 Internal alterations are implemented to rationalise the plan including the provision of a new bathroom and solarium located within the roof of the house. 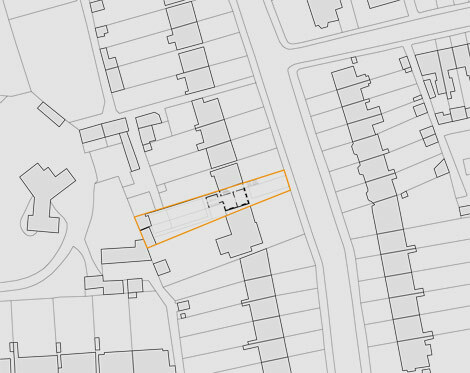 The work also involves a new layout for the garden in granite, gravel and grass following the geometries of the new addition and the existing building. 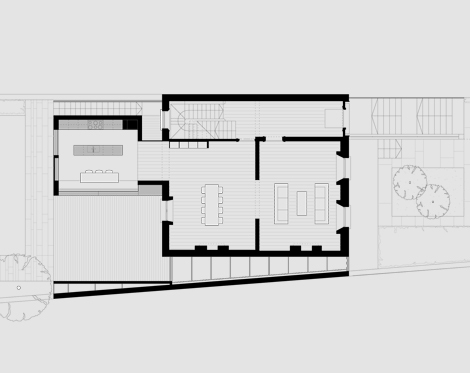 The client wished that the main family activity should remain on the first floor of the house, so a new kitchen is placed adjacent to the two main reception rooms, connecting with the dining room through a rotating bookcase and sliding doors to the living room beyond. Below, a playroom connects directly with the garden and patio. 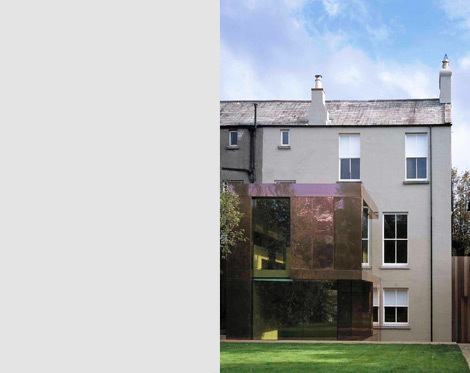 Externally, the addition is a sculptural, abstract, bronze clad volume that rests alongside the existing house, held in a teak fold formed by the adjoining deck and vertical garden screens. The proportions and articulation of this sculptural object are determined by both use and context. 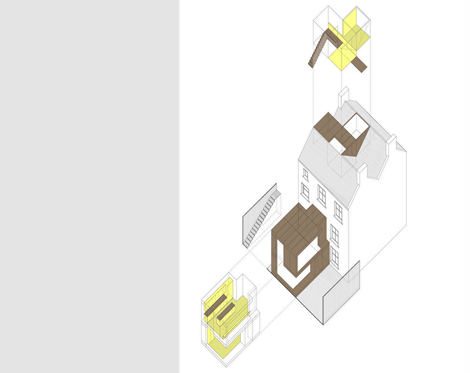 Through the subtraction of the original orthogonal form the addition reads as an independent object at first floor, providing spatial relief to the large sash window of the dining room. At ground floor, the space turns and connects directly with the garden through its section. 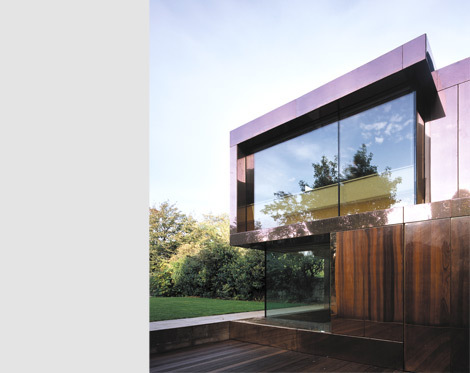 Light and views are controlled by the solid, void relationship of bronze and glass. 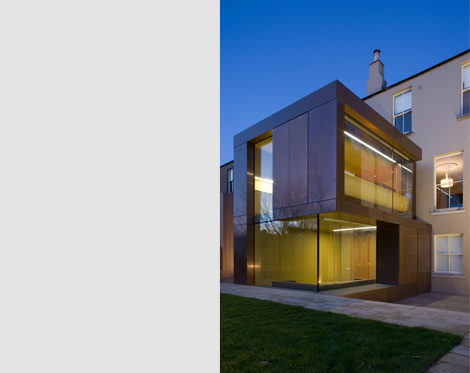 Large pivoting bronze clad doors provide all ventilation and access to the new addition and a teak staircase runs along the northern boundary wall to serve the garden directly from the first floor. 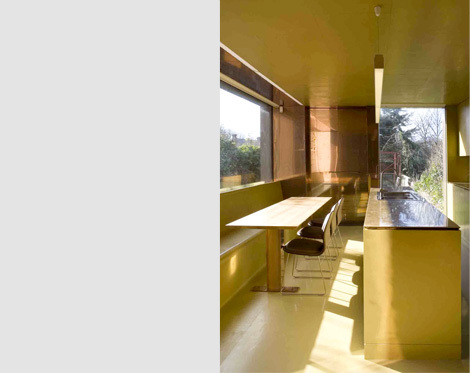 Internally, the addition and all the other spatial interventions in the house are lined in pigmented rubber. 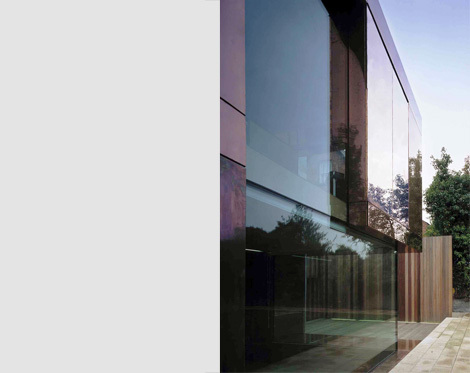 Rubber is also used to face all the fitted furniture in these rooms to lend uniformity. 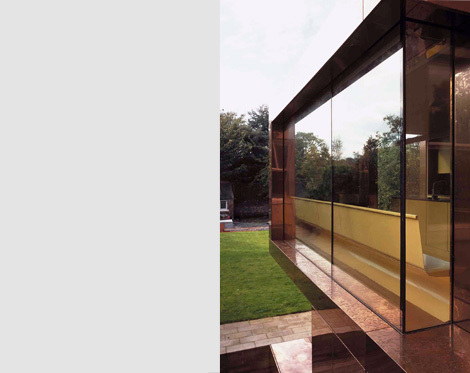 A rubber and steel bench for instance, lifts in a fold along the south side of the kitchen to form a window seat for the family. 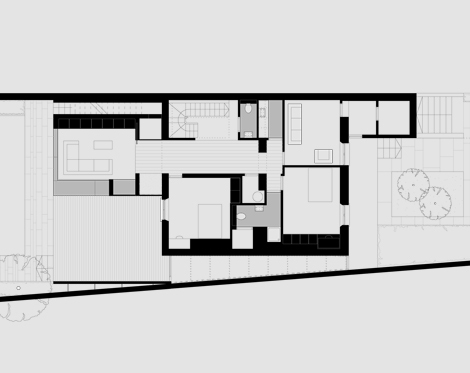 One space, a bathroom and solarium, is constructed within the roof and central valley of the house. From the solarium, there are panoramic views over the city and the bathroom is sky lit. 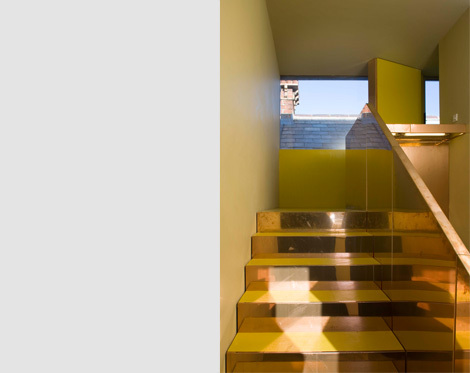 The external walls, the lowered ceiling over the hallway below and the staircase serving this space are all clad in bronze to form another sculptural intervention.